Here's a populist axiom for you: Genre readers have more fun. The literati may garner awards and critical praise, but they rarely make one smile. Popular authors, though, have license to be playful. Consider the beautifully illustrated Web comic Tuna Carpaccio P.I., a send-up of hardboiled that's alternately corny, sardonic and surreal. Start at the beginning of the fisticuff-loving, chronically incompetent investigator's adventures by clicking here. A new strip is added every Monday. Thanks for reminding me to get my weekly dose of tuna. And that's a cool photo. Ah, the joys of Flickr! Wow ... that's one big tuna for two small kids. 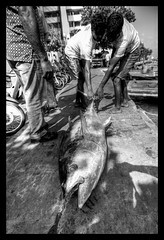 The guy who took the photo says the fish was caught in Maldives, which seems to be in south Asia. He's got a lot of fun travel pics up.